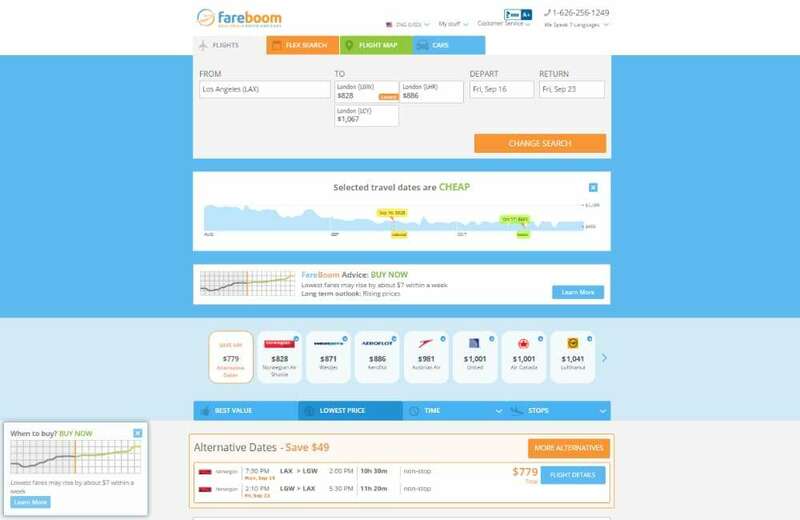 Fareboom.com is a project by Best Travel Store Inc., a US-based online travel agency. It has been developed by the AltexSoft team in order to substitute an older version of the company’s booking service. One of the major product updates that needed to be delivered by our team was Fareboom Price Predictor. The goal was to implement an innovative fare forecast feature on top of the company’s existing travel booking engine. Price Predictor had to complement the core search functionality and help users make better purchasing decisions. It needed to be designed for the price sensitive customer to target the best possible time to buy an airline ticket over several months. Since Microsoft withdrew its Bing flight predictor feature from the Travel portal in 2014, major market players have been trying to take its place. While other services, such as Kayak fare predictor and Skyscanner, offer similar fare movement forecast options, the niche is still highly competitive as there is always room for improvement. Armed with 10+ years of experience in the travel industry, our client has decided to enter the competition in order to provide users with better customer service and more price saving opportunities. The goal was to build an intelligent algorithm, able to forecast future price movements based on historical data and smart predictive analytics models. To be able to predict the future price movements, our data scientists studied the historical data about airfare trend changes over the past several years. The actual information from millions of searches, processed by the Fareboom search engine was used, to make the predictions highly reliable. In order to increase the amount of data and statistical power, we handled neighbor travel dates data and clever merging algorithms to form the time series for further forecasting. Employing advanced data mining and aggregation techniques, the team was able to understand and visualize the hidden patterns. Based on discovered patterns, the team formed algorithm models with different parameters. 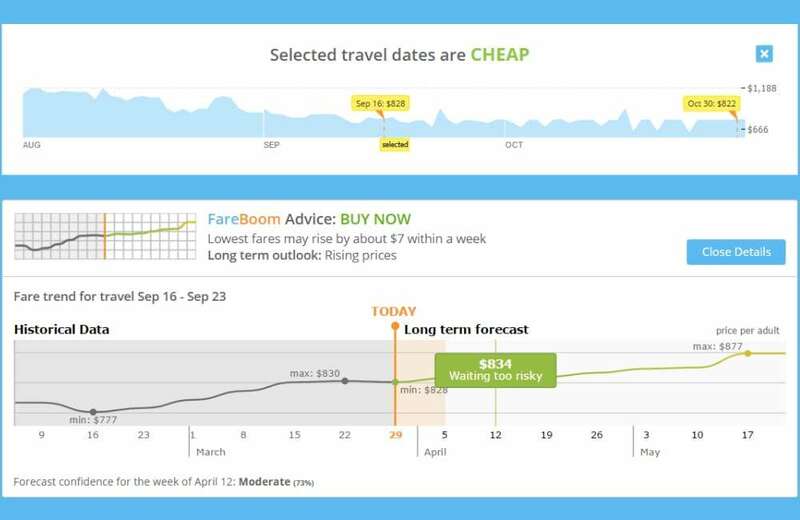 The info about actual flight fares helped us find the most suitable prediction algorithm: Setting the system parameters of the recent past, our data scientist ran the algorithm to predict the fares we already knew. Thus, we were able to validate or disprove the hypothesis based on exact information. The final algorithm has an average confidence rate of 75% and uses a time series forecasting to make both long-term (7 weeks) and short-term (7 days) predictions. The algorithm is constantly being improved through machine learning techniques, based on the factual information about the confirmed and disproved predictions. The Price Predictor feature is integrated into the existing fare search functionality and is shown to a certain segment of the Fareboom users (currently about 20%). Being displayed in a form of a search module and a popup window, it is sure to grasp the user’s attention and allows for a multitude of interactions (e.g. Close Popup, See More) and events (e.g. scroll, hover over, etc.). Therefore, we can track multiple stats and adjust the user experience based on them. For example, we have found that Price Predictor has doubled the average time per session within a month since the release and continues to grow the conversion. 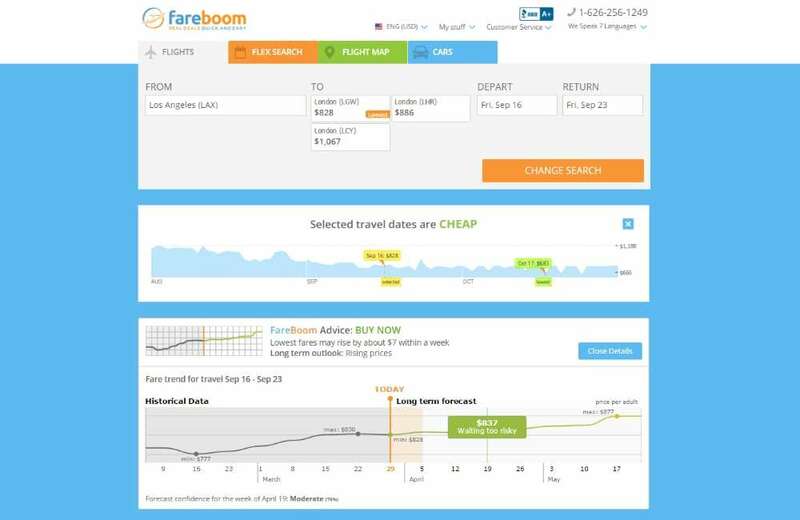 The FareBoom Price Predictor tool was developed within 6 months by a dedicated team, consisting of a Data Scientist, a UX/UI Designer, and 2 Software Engineers. The prediction algorithm was developed using the R programming language and then converted to C# to comply with the product. Additionally, we have applied the following techniques: Data Mining, Data Aggregation and Extrapolation, Time Series Forecasting.